The focal point of this post has to be - I loved this collection. There were so many pieces that reflected the key trends seen on the major runways for Spring 2012. 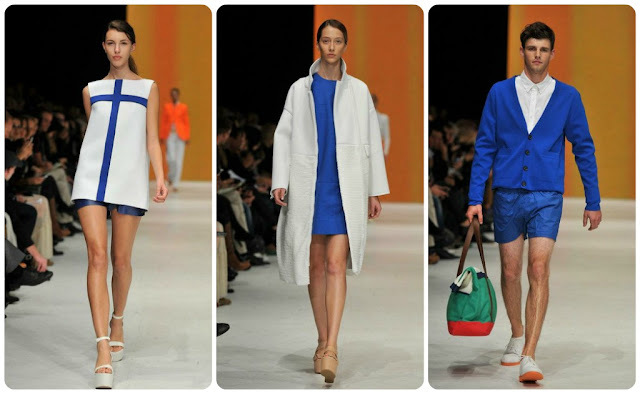 Sporty, bright colourful pieces, with lots of bright-white dresses and garments walking the runways as well. What always makes me love Joe Fresh even more though, is that these are pieces I'll actually be able to afford when they arrive in stores. To keep from posting every single look from the collection (even if I did pretty much love them all) - I've broken down a few of my favourite micro-trends from within the pieces that walked the runway. White, white and more white! 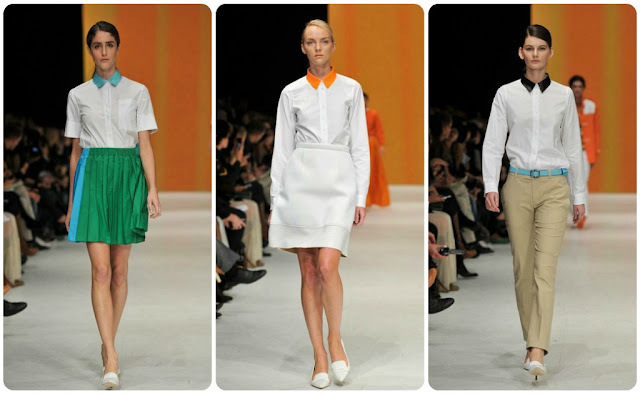 I loved these clean, crisp all-white looks, seen on many of the Spring runways from New York to Milan - and now Toronto. As much as I fear wearing white due to my inherently clumsy tendency to spill things on said white clothing, I can't resist the stark brightness of it. So perfect for summer days, especially with pops of colour - the bright orange ribbons or collars, and the pops of yellow on what appear to be super cute loafers (Wishlist? Check). P.S. Shout-out to the lovely Herieth Paul (third from right) - Ottawa's own top model. Okay, I admit, this is menswear, but I LOVE these printed blazers! How unfair that they are only for the fellows! The prints and colours are amazing. 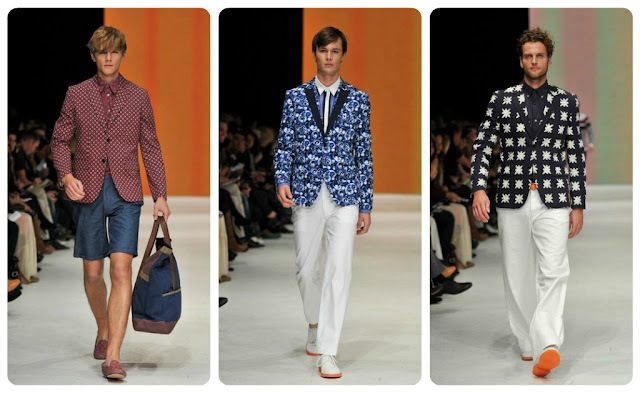 As soon as I saw these looks on the gents strutting down the runway, I thought to myself - where is my version? Note - none of the ladies on the Joe Fresh runway wore blazers this cool. No lie, I may purchase from the mens section and have them tailored to fit so I can have these for my very own. Yellow, lemon, citrine, goldenrod - whatever you want to call it, there were a number of mega-bright yellow pieces in various incarnations strolling down the Joe Fresh runway. I can't think of a more perfect colour for spring and summer than sunshine-y yellow, and I look forward to adding some of these (especially that awesome maxi skirt) to my wardrobe when the weather warms up again. Another trend spotted on the Joe Fresh runway was the coloured collar. I love a basic white blouse in all its forms, but with a fresh pop of orange teal or black, it adds fun and interest to this classic wardrobe staple. I will be looking for these when they hit stores, I can tell you that. I'm not sure if Mr. Mimran was wanting to pay homage to our friends in Finland, but the opening look to the show certainly made it seem that way, if you've ever happened to notice what the Finnish flag looks like, that is. In any case, the combination of bright blue and white popped up a number of times on the runway, and since blue is one of my favourite colours, of course I am a fan. These micro-trends and many more great wearable pieces strolled the Joe Fresh runway, and I definitely loved the show and collection as a whole, even if my experience surrounding the Joe Fresh Show was less than stellar. If you're ready for a bit of a rant about the events on Wednesday night, read on. First, I will note that this debacle was the not the fault of the brand itself but rather was the fault the organizers of LG Fashion Week, who were responsible for ticket sales. I was standing in line with easily over a hundred others, and was in a decent spot, not right up front but not near the end either. I knew this would be a popular show so with ticket in hand I got there early. After waiting and waiting with fellow hopeful show-goers, we noticed that after the Media, Sponsors and VIPs had been seated that the venue was looking particularly full, and wondered if there would be any seats left. Within minutes of the show starting, volunteers came around to tell everyone that after a mere 10 general admission ticket holders were let in, not one single other person in line would be able to see the show. Ten! Paid tickets, no show: seriously unimpressive. I mean, it seems pretty simple - if you sell tickets, and based on sales have an idea of how many potential seats there will need to be, make sure to have enough! Otherwise don't sell the tickets! Not rocket science, organizers, just fyi. Needless to say, all of us went home disappointed. I wouldn't even have minded if Joe Fresh was a show that was only open to media and invited guests - as most fashion shows in major cities often are. In which case I would not have bought a ticket and happily would have watched the show via livestream from the comfort of home, or gone to spend time with friends in Toronto rather than wasting a whole evening waiting for a show I didn't get to see. I have to say, it was a super disappointing end to an otherwise really great day spent at LG Fashion Week. I know no event is perfect, but I think this was a pretty gigantic oversight and faux-pas on the part of organizers, and could easily have been prevented. Hopefully this kind of thing will not be repeated next time round. Thankfully, the shows on Thursday were so great that this disappointing debacle was not the lasting impression I had of LG Fashion week, and rekindled hope in me that it wasn't a total waste of time coming down from Ottawa. Look forward to a post on the Thursday shows coming up soon! Loved this collection too! Shame about all the ticket holders not getting in though..
Did they refund you all for your tickets? You're right- that IS horrible organization and completely unfair. They should have never sold more tickets than they had available. I really liked the coloured blazers, but wonder if I actually know any men that will wear the patterned blazers?